(Alternate Reality children)– Miguel MCcoy (Son), Ciaran MCcoy (Son), Francesca McCoy (Daughter). Skills and Abilities: Possesses advanced knowledge of the medical field thanks to PHD in medicine, capable street fighter. Powers:Cecelia has the power to generate a life force generated/sustained Force field. Unlike most other force field generators she still feels all attacks on the surface of the force field since it’s an extension of her life force. Defensive use of her powers has demonstrated that she can extend the field to envelop others and block even point blank gunfire and laser blasts. Offensively she can shape the field into a variety of shapes and forms, limited only by her imagination. She has shaped it into spikes, a bat and a club on different occasions. Her powers are instantaneous meaning she does not need to mentally turn it on or off for it to work. Also of note, using her powers causes her physical pain each and every time it is used. Cecilia grew up in a poor community while in her native Puerto Rico. She was the second child of her family after older brother Miguel. One day she witnessed her fathers death outside the house and unable to save him he died in her arms. This traumatic event left the young Cecelia a very motivated young woman who dedicated her life to the study of medicine.This ambition and single minded drive allowed her to leave her life in Puerto Rico and pursue her dreams in the united states. While studying her PHD she was approached by Professor X who tried to recruit her into his first squad of X-men. She declined, preferring to save lives as a doctor instead of as a hero [Uncanny X-men v1. #389]. After she graduated she always feared that her status as a mutant would destroy the life she had made for herself [X-men #66]. During Operation Zero Tolerance her fears became a reality as the X-men were captured and all their files stolen. While at work a patient who had just died came back to life and attacked her as a prime sentinel [X-men #65]. Iceman saved her and the two were joined by Sabra and Marrow to make a short lived X-men squad which ended Operation Zero Tolerance [X-men #66-69]. Hoping to rebuild her life she remained with the makeshift X-men team and saved Cyclops life [X-men #70]. While outwardly appearing tough and apprehensive she befriended Storm [Uncanny X-men #351] and Maggott. The mutual interest in biology also drew her to Beast whom she awkwardly flirted [X-men #71]. She also reluctantly participated in battling the other-dimensional demons, the Rutai. Cecelia ended the threat by landing the decisive blow [X-men #75]. When the team battled the Shadow King she was tempted into leaving the X-men by siding with the villain in exchange for whatever she wanted. She managed to not give in and later gave the villagers medical help after the battle [X-men #77-78]. Beast also attracted to Cecilia took her on a date to the opera which was also attended by Mr and Mrs. Fantastic. Their they were subject to the Psycho Man’s powers and she attacked her teammate. When the threat ended she felt totally violated that her fears and angered had been triggered [Uncanny X-men/Fantastic Four Annual 1998]. Sometime later she left the team to return to medicine. She “house sat” the X-mansion during the Search for Xavier storyline [Uncanny X-men #360]. She would soon find that leaving the X-men didn’t mean a return to normalcy when Nightcrawler critically injured teleported into her office and pulled her into the battle with “The Neo”. With Nightcrawler injured she lashed out with her powers and killed the Neo leader Jaeger [Uncanny X-men #100]. Now hunted by his team and overwhelmed by the pain she suffered while using her powers she used the drug “kick” which enhanced her powers and numbed the pain. She saved many lives while using the drug but became addicted [X-men #101-102]. After she was rescued she went “cold turkey” and kicked her addiction by sheer force of will [Uncanny X-men #389]. Unfortunately she would bear witness to the death of Colossus after he injected himself with the legacy Virus cure. This lead to her remembering how her father had died in her arms years before [Uncanny X-men #390]. Again she left the X-men but found herself captured by Weapon X and was reunited with former teammate Maggott. After he was killed she used her medical skills to keep her fellow captives alive [Weapon v2. X #5]. She managed to survive the ordeal and returned to medicine in China town [NYX #4]. Cecilia shows that she’s still in contact with Beast and still keeps a picture of them beside her bed [NYX #5]. With the creation of Utopia she rejoined up with her fellow mutants. 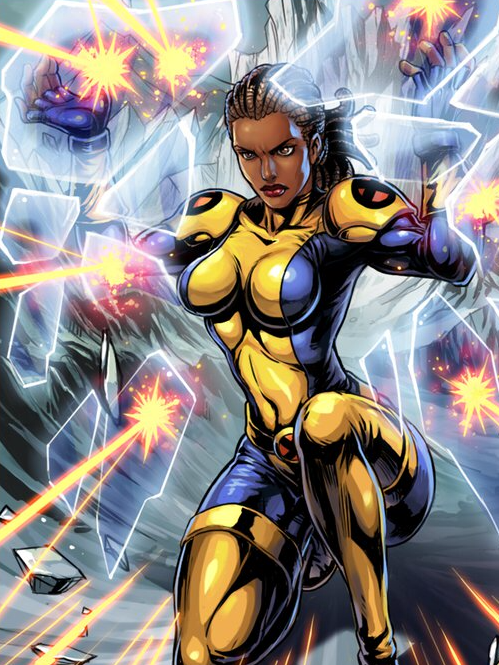 She later joins the astonishing x-men beside Ice-Man, Gambit and Northstar. Cecilia attends the wedding of Northstar and Kyle Jinadu [Astonishing X-men #51]. Why all the sisters gotta go with the animals? Blind girl Alicia with the giant rock the Thing in the FF movie,Storm and psychotic midget Wolverine and Cecelia with a furry Beast?!? Does anyone else have a problem with that besides me?